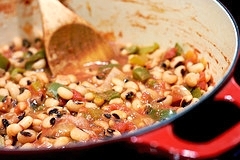 I have more than just a recipe for spicy black eyed peas, check out more recipes at the end of the page. This dish is sure to bring Good Luck and Prosperity (everybody could use that) for the coming year. I really enjoy this easy meal and be certain to serve with homemade cornbread and collard greens; recipe below. For the peas, I generally let them soak overnight. If pressed for time, you can cover them with water, bring to a boil and boil for 2 minutes, remove from heat. Cover and let soak for 1 hour. In a large saucepan, cook bacon until crisp. Remove bacon, crumble and set aside to use as topping for peas. Add onion, celery, green pepper and mushrooms in the bacon drippings and sprinkle with the garlic and onion powder. Cook for 5 minutes. Add peas, diced tomatoes and green chilies, salt, chili powder, pepper and water. Cook, covered, over medium heat for 1 hours or until peas are tender. Add additional water of necessary. Sprinkle the top with the crumbled bacon and serve with cornbread. You may also fry up some Polish sausage and add to the dish. It's delicious. This recipe is my favorite. You haven't had real cornbread until you've baked it in a cast iron pan. A must with spicy black eyed peas. Enjoy. PREHEAT oven to 375 degrees. Grease a cast iron pan with 1/4 cup shortening and place in the oven to preheat. Melt the butter in a saucepan and add the sugar. Whisk in the eggs and mix until combined. Combine the buttermilk with the baking soda and add to the pan. Fold in the dry ingredients and mix until JUST COMBINED. Please do not over-stir this batter. Pull the cast iron pan out on the rack and pour the batter into the hot pan. Bake for 30-40 minutes or until a toothpick inserted in the center comes out clean. The edges will be a golden brown. Leave in the pan and cut slices like a pizza. Serve warm. *Place 1 tablespoon of lemon juice or vinegar in a 1 cup measuring container. Fill the remainder with milk. Let sit for 5 minutes, and it's ready to be used in the recipe. Photo courtesy of Monica Shaw.